About Me – Welcome to Kadydid Studio! I first learned to sew when I was 8 years old. My mother taught me alongside the other girls she taught in our local 4-H group. Growing up I mainly made garments and was introduced to quilting in my early twenties. I was engaged when I took my first quilt class where I learned to make a hand-sewn sampler quilt. I picked out fabrics to create a quilt that would be used in our new home. I was hooked. I have always loved to sew, but I especially enjoyed making craft and quilt items. While raising our children, I never seemed to have enough time to sew. During the summer of 1999, my mother and I pieced together matching quilt tops for my two daughters. We finished them just before my parents headed to Arizona for the winter. We planned for her to quilt the layers together when she returned the next spring. Unfortunately, that never happened. Both my parents died as a result of a tragic car accident just a few days before they were to return to Michigan. The quilt tops sat untouched for a few years. I tried to quilt them on my domestic machine, but it was just too difficult to maneuver the large quilts under my own machine, which also caused terrible shoulder pain. I reached out to an instructor through a local quilt shop. 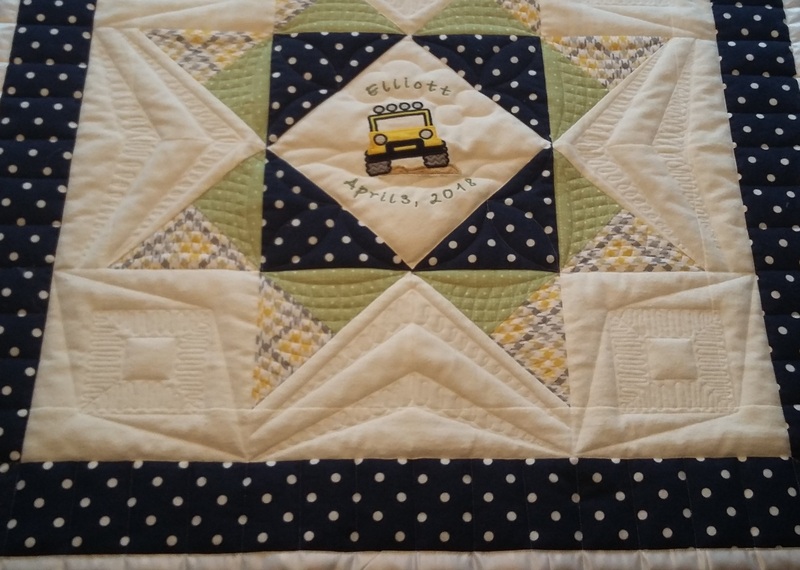 I had taken a couple of classes from her and found out she quilted for others and she finished the quilts on her long-arm quilting machine. That was my first introduction to long-arm quilting. She quilted a few other quilts for me and did a wonderful job, but I thought - if I only had my own long-arm machine I could do my own quilts. In the Fall of 2016, I attended the AQS Quilt Show in Grand Rapids where I tested several long-arm machines. I also gathered all the information I could about them. My goal was to purchase a long-arm machine and start my own quilting business. I also took a couple of ½ day classes to further try out my top two picks. In February of 2017, Freddie arrived. Freddie is my new APQS Freedom and I am now in business! Please check out my Gallery page for project pictures, or click Contact and let me know how I can help you.